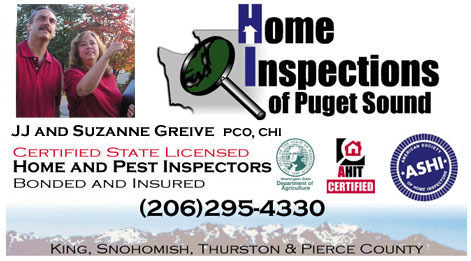 Seattle's Home Inspection Team- New homes and warranty inspections. Does this sound like your experience with your new home and contractor? Does this sound like your experience with your new home and contractor? If you have a legitimate problem with your builder and they have been unresponsive, we are here to assist you. We will document the issues and if necessary we are willing to be called as expert witnesses in court proceedings. We never encourage litigation and this is a last resort, but it is sometimes necessary. typical issues we report on. disconnected duct work in attic, furnace in attic in error state, (4 red flashes of the diagnostics LED), wood debris and construction trash left in crawlspace, bare earth in crawlspace, poor caulking of the siding, and slight gas leak at the supply line to the furnace. 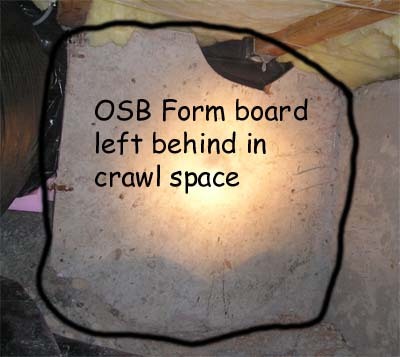 While inspecting the crawlspace we found wood debris (form board not removed) and bare earth. These are conducive conditions for structural pests (carpenter ants, termites and wood destroying beetles, etc). According to WSDA conducive conditions for an infestation of wood destroying organisms includes cellulose debris. " Where wood by-product material can be raked or is larger than can be raked, or where any stumps, roots, form boards, etc., are on the ground of a crawl space. 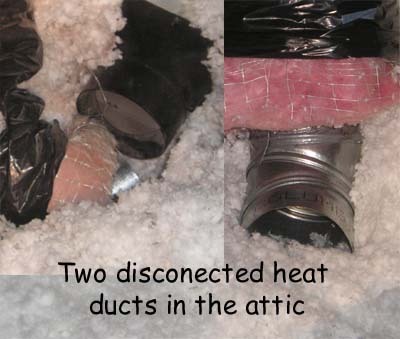 During the attic inspection we found the ductwork disconnected and furnace was in a error state. The pictures to the right are of 2 different ducts in the attic that were not connected at the time of our initial inspection. These are warm air ducts that were laying in the insulation, not connected to the ceiling vents. The diagnostics fault codes were printed right on the front of the furnace (see picture) It was blinking the red LED 4 times. I didn't know that at the time but upon further research I found this. "Four Red Flashes - High limit switch open or 24 volt fuse is open. This may be caused by a dirty air filter, improperly sized duct system, faulty blower motor, restricted circulating airflow or an open fuse on the control board." I did a little research and found that there were several home in this development with warranties that were approaching expiration. I made a mailing to the owners of these homes informing them of our warranty inspections, and I soon booked an inspection of a home down the street. At this home we found a few significant problems. This included bare earth and wood debris in the crawl space, missing gutter and downspout, poor caulking of the siding and incomplete repairs of the roof. This customer had a roof leak in her home, and the contractor made this "repair". Does this look complete to you? She was told the roof leak was fixed, and it looks like it was. But the contractor never finished the siding, trim, flashing, stonework at the corners, a disconnected downspout not to mention the painting and caulking. This incomplete repair was only visible from the roof, on the 2nd story. When I came off this roof with the pictures for my customer, she was quite upset, and rightly so. After looking at this I realized the repair was required because of a very low slope of the valley between the tower and the slope of the roof. 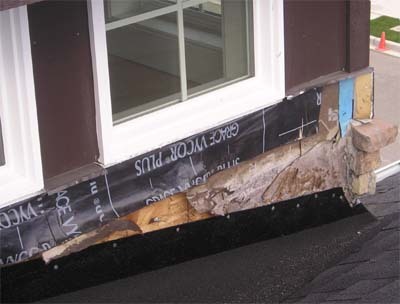 The original roofing was an architectural 3 tab and it performed poorly due to the low slope. I made a note of this repair. About a week later, I got a call from my first customer, she wanted me to re-inspect the repairs to her new home before she would close the deal. When I came back to C----- C---- Estates to re-inspect her house I was greeted by the builder as I drove into the development. Dennis the contractor was very hostile. He said that if I inspect homes in his development I must have his permission and that he will have his employee follow us throughout the inspection. The employee that followed us was also hostile. Now I don't know about you but it strikes me as the height of arrogance to have your builder tell me as an independent inspector that I must get his permission to inspect homes in this development. These are PRIVATE HOMES, and their antagonistic builder has no right to set restrictions on who they choose to inspect their property! So on with the first customers re-inspection. 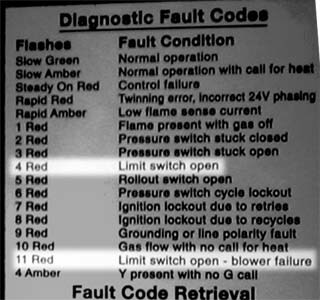 "Eleven Red Flashes - Main blower failure - This flash code occurs when the main limit opens and fails to re-close within five minutes, indicating that the blower motor or blower wheel has failed." 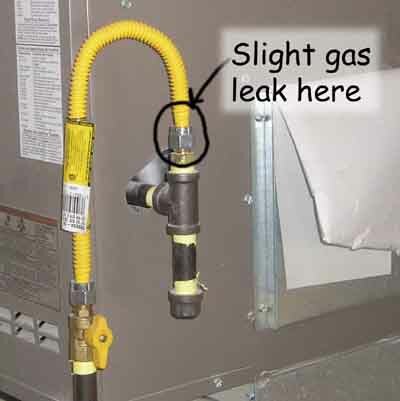 I re-checked that gas line and it still had a slight leak. My detector found it, I could smell it, and so did his own employee that shadowed me throughout the inspection. I proceeded to inspect the crawlspace. The bare earth was still there, and so was that form board. The employee called Dennis the contractor. While I was under the house he came to the site and he was irate. Like I said earlier, our Tif 8800 is very sensitive. He squirted soapy water on the hose and insinuated we were making the problem up. Maybe instead of being so difficult he should have brought a wrench. One twist of a tool and we would have nothing to report. Heck I am a builder too, if I had a wrench with me I would have fixed it myself just to avoid that hassle. I stand by our inspections, that hose is leaking, positively! Granted it may be a small leak, but it is leaking. So up to the roof. This customer has the same valley on the roof that customer #2 had, and with the same roof covering that failed on the other home. As I am going up the ladder, Dennis's employee yells up to me that they are going to repair that valley that leaked on the other home! Just as I suspected, that very low sloped valley had architectural 3 tab on the back side of that entry tower. C----- C---- Estates mission statement is, "Expectations being met, promises delivered. It’s all about you!" I don't think so! 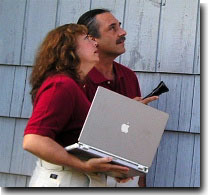 These home owners bought beautiful homes for more then a half a million dollars. We don't work for contractor Dennis or C----- C---- Estates, that is why they don't want us to do our job. I will not be intimidated by a hostile contractor, and don't you be either! Make sure you get the value you paid for.